T-N-T Moving Systems has maintained a clean record with the U.S. Department of Transportation and the Federal Motor Carrier Safety Administration. Charlotte Moving Company Receives Excellent DOT Reviews! The U.S. Department of Transportation inspects, rates and keeps records on all interstate moving companies. Since their existence, T-N-T Moving Systems is reported as to having a clean record with the U.S. Department of Transportation and the Federal Motor Carrier Safety Administration. On the Federal Motor Carrier Safety Administration (FMCSA), a citizen can search any interstate moving company in to find that company’s report. “This is great news for T-N-T. We aren’t the biggest moving company in Charlotte, but it’s hard to beat our record of zero complaints!” said Tom Tulowieck, co-owner of T-N-T Moving Systems. According to the FMCSA website, each interstate moving company is reviewed on the BASICs. BASICs stands for Behavior Analysis and Safety Improvement Categories. The categories are Unsafe Driving, Hours-of-Service Compliance, Driver Fitness, Controlled Substances and Alcohol Violations, and Vehicle Maintenance. The ratings are based on a 24-month period of review. Summer is by far the busiest season for moving companies. According to the Census Bureau, about 12 percent of Americans move every year and about two thirds of these moves are to a new state. June, July and August are when about half of all moves take place. Finding the right moving company can be a challenge any time of the year, but especially during the busy season. The FMCSA website is great place to start in researching a moving company’s reputation. The two categories to look at closely are Hours-of-Service Compliance and Controlled Substances and Alcohol violations. A driver needs to be alert and sober when operating a large truck, especially one that holds such precious cargo. Another resource is websites like Yelp that review local companies. Friends and family can also be a vital source to recommend a good mover. T-N-T suggests getting quotes from at least 3 different companies, and keep in mind that the cheapest is not always the safest. “Don’t let price be the deciding factor, make sure you can trust the movers as well,” advised Koepke. T-N-T prides itself on being a small enough company to build personal relationships with their clients, but large enough to handle any moving job. 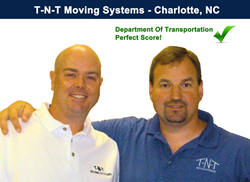 T-N-T is a local Charlotte company that provides long distance move services. They are also the official movers of the Charlotte NFL team – the Panthers. Their services include transportation, loading and unloading, and packing. For more information, visit their website at http://www.tntmovingsystems.com.